When someone asks me which came first, I always say the egg. I firmly believe it. Inspiration and possibility. By nature, the egg is an optimistic object. It is also an sublime work of nature, not to be taken lightly. 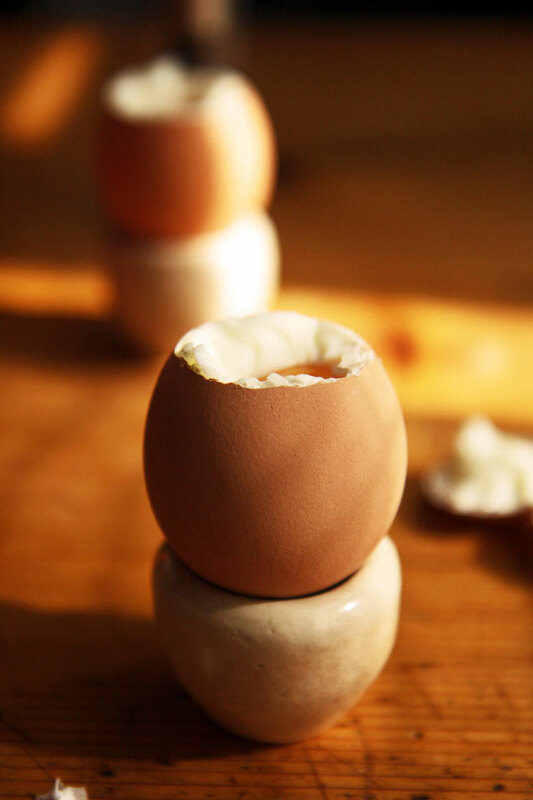 I dip my little tea spoon into a soft boiled hen's egg in the morning and think of the possibilities. One must begin somewhere, yes? Strolling the outdoor markets in France, you might be surprised to see eggs stacked out in baskets for sale in the open air. This certainly came as a surprise to me when we first arrived here, because I was raised to believe the eggs were instantly poisoned if they were left out on the counter for more than 10 minutes. In the years since we arrived here, my vision of things, of eggs, has shifted, adapted to the culture. Here in France, eggs are stored in a cool place, and rarely ever refrigerated before they're sold, even in a grocery store. It wasn't until I came to France that I learned that eggs are best stored away from the odors and moisture of a refrigerator, at room temperature. I also learned what difference in taste a good egg can have. One that came from a happy animal. 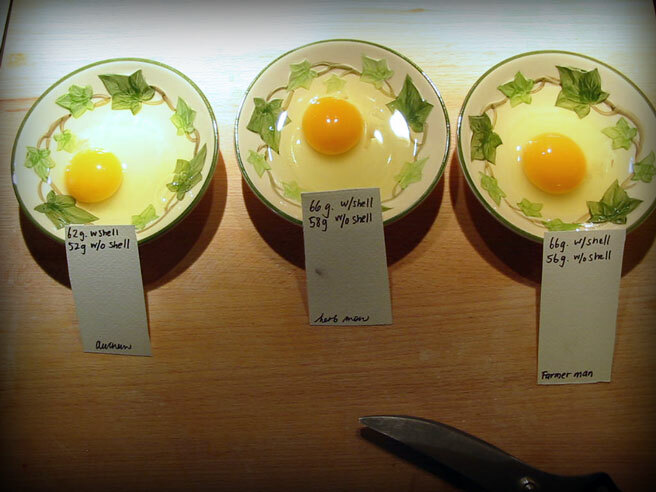 The sun and the air, the ground and whatever springs from it can make a difference in the egg quality. I choose my eggs carefully. You should too. By looking at the code which is a legal requirement in the EU to egg farmers who sell their product, you can tell a whole lot about what kind of egg you're getting. Even the humble farmer selling his eggs at the market has a number. The lady who sells us eggs displays her number on a sign. The most important digit is of course the first one. From it you can tell a lot. 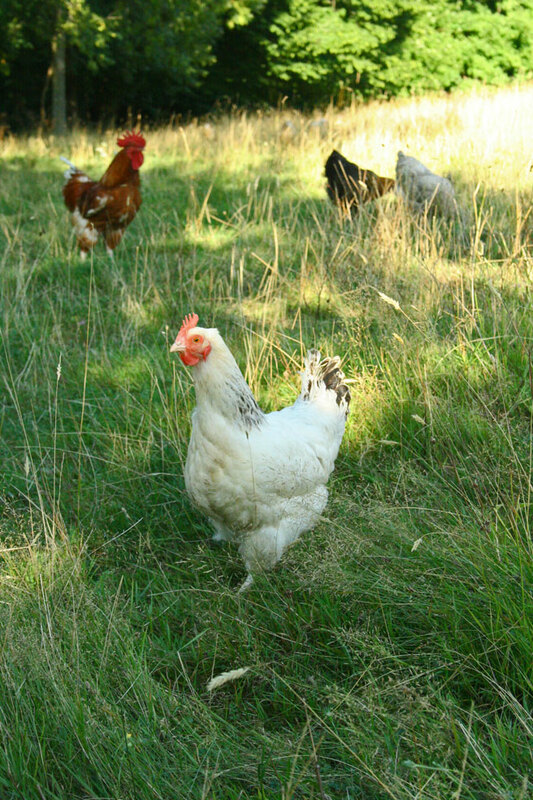 from a farm in Bresse. After that, your eggs are marked with codes for their provenance, and the last digits further identify them by their flock number. Why is this? 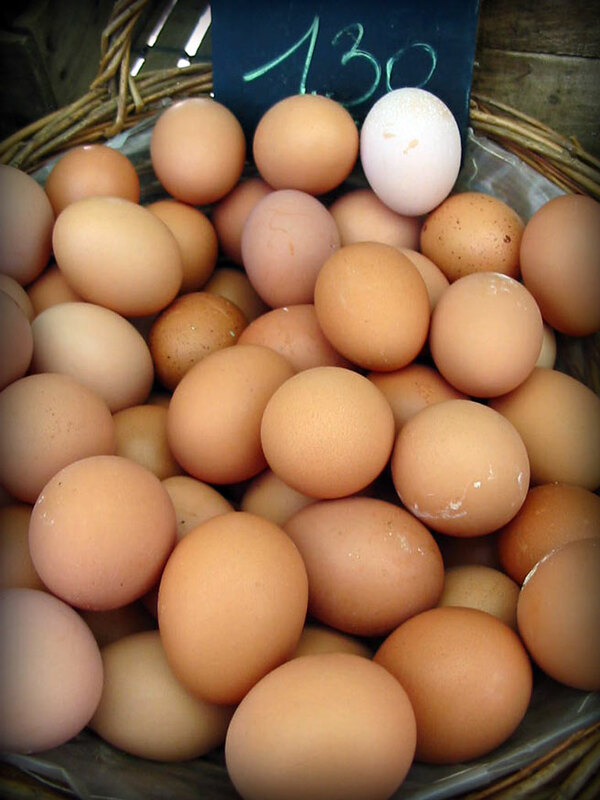 Salmonella comes from sick animals, and not from spoilage of the egg after it is laid, as some might believe. The shell of an egg is a resilient and natural protector of its precious cargo. Once an egg is cracked, its naturally hospitable contents are open to whatever might be lurking about, so be careful with prepared dishes containing raw eggs. Thanks for this informative post. I'm amazed how many still have so little knowledge about eggs. I enjoy going off with my little egg baskets and choose the eggs I want...with the finger of course, no such thing as touching the eggs...and vegetbales here! A lovely post, as usual. I do wish we had a similar grading system here in the U.S.
At the Union Square market in NYC, the purveyors generally keep their eggs out in the open, not refrigerated. I once witnessed a woman snappishly say, "You don't keep your eggs cold?!" The purveyor calmly (with a slight smirk) replied, "Well, ma'am, they didn't come out of the hen refrigerated." The woman pursed her lips tightly and bought her farm-fresh eggs. I would love to direct that woman to your post! Very thought provoking and informative. Here in the U.S we have to figure out what the labeling of eggs really mean and then do not have the same clear information you do. My older brother and his wife were planning to take a tour of Southern France this fall. I convinced them that they should go on their own so they could enjoy the gardens and markets at their own speed. In September they will fly in Paris and then take the high speed train to Avignon where they will rent a car. They have rented a cottage just outside Saint Remy-de-Provence for a week. They would like to explore the small villages and rural areas in that area. They will be driving back to Paris and I hope they will make a stop in Lyon to see some of your markets if the timing is right. I am looking for any suggestions to pass on to them so their trip will turn out better than a tour. As usual, beautifuly photographed and well written. I noticed sometime last year (or the year before) that an egg coding system appeared here in Canada (or at least in Ontario). Unfortunately, it seems asi if compliance is voluntary, so only a few brands bother. 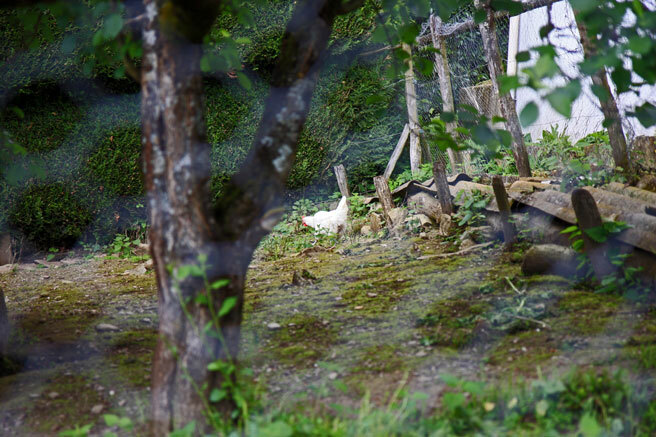 In the city of Portland, we are allowed 3 chickens to raise in our backyards. There's nothing like the taste of fresh eggs. I always find your post a delight to read especially on the outdoor markets and such. Very informative and sublime photographs. 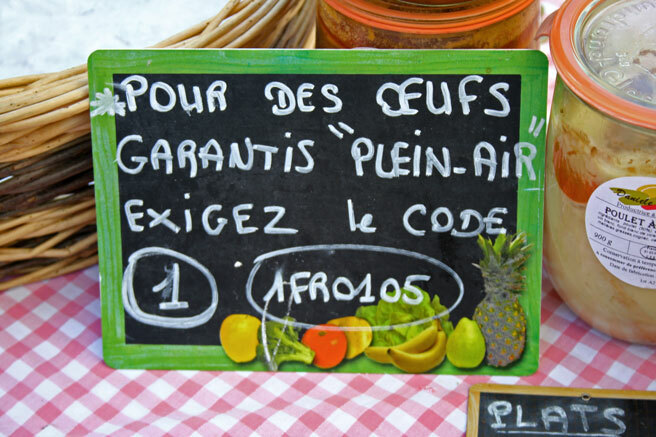 I didn't know about the codes on the eggs in France, so thank you! I was the same way before moving to France: I never would have kept my eggs (or my milk, for that matter) outside the fridge. But now I know better, and the bright orange yolks of the eggs from my farmer's market are worth the change in attitude. When we first moved across the pond, to Ireland, I was so nervous at the B & B we were staying in. The woman left the eggs sit right on the table...ALL the while she fixed breakfast!!!!! I could hardly stop myself from jumping up and putting them, safely, in the fridge. I'm just a wee bit more relaxed about that now... and most other stuff as well! Didn't know what the numbers meant - thanks! I enjoyed all this information, thank you. I remember when I went to cooking school in France, near Tours, Monique had a huge basket of eggs on the counter . They were never refrigerated. We took them from the same basket for several days. I was praying I would not be sick....how silly of me! Unlike the eggs in this country, she knew where they came from and just exactly how fresh they were......she had no reason to worry about a bad egg. Amazing!